The new edition of Allergy, by Drs. 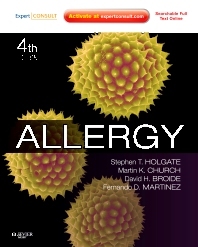 Stephen Holgate, Martin Church, David Broide, and Fernando Martinez, uses an enhanced clinical focus to provide the clear, accessible guidance you need to treat allergy patients. A more consistent format throughout features new differential diagnosis and treatment algorithms, updated therapeutic drug information in each chapter, and additional coverage of pediatric allergies. With current discussions of asthma, allergens, pollutants, drug treatment, and more, as well as access to the full text and illustrations online at www.expertconsult.com, this comprehensive resource is ideal for any non-specialist who treats patients with allergies. Prescribe appropriate therapies and effectively manage patients’ allergies using detailed treatment protocols. Identify allergic conditions quickly and easily with algorithms that provide at-a-glance assistance. Explore topics in greater detail using extensive references to key literature.